Andy Williamson expressed Dayton’s potential, saying “we’re the hub” for attracting visitors from other cities; he hopes larger venues choose to book popular music performers to cash in on our central location. Amy Forsthoefel wants to find a single source online for all events happening across the region. Damion Smith believes he would spend more time downtown if options other than bars were open later than 6 PM. Although they have different ideas, they all agree that the entertainment opportunities are a major factor in where they plan to settle down and become part of the community. On Tuesday, February 10, updayton gathered over 40 young professionals in the Oregon District to discuss concerns and to determine what they want for entertainment and nightlife options in the region. Lead by Scott Murphy and Tokz Awoshakin, the focus group provided updayton further direction in planning the April 18th Young Creatives Summit. 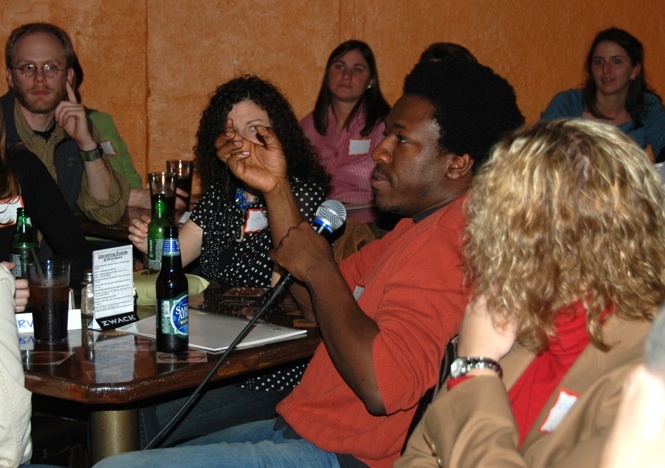 Tuesday’s ‘Perspectives and Pints’ was the second in a series of focus groups to determine what young creative professionals want from the Dayton region. Participants shared many positive aspects of the Dayton area such as world-class arts and cultural opportunities, friendly and creative people, and the feeling of being part of an exciting and diverse city during Urban Nights. Some challenges to the area include a lack of walk-ability, transportation concerns, and a need for more affordable arts experiences. In addition to this focus on entertainment issues, other P&P topics for discussion include communities and neighborhoods (December) and diversity (scheduled for March 11). 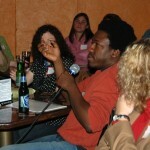 ‘Perspectives and Pints’ is a series building up to updayton’s Young Creatives Summit on April 18. This summit will focus specifically on the needs of young creatives. In the current climate of economic development and change for the region, the needs of this younger creative demographic are especially important. The decisions confronting these professionals are some of the most difficult and important they will make in life – choosing a job, selecting a city, and continuing education among others. Understanding what influences these choices is critical to plugging the brain drain that plagues our region. What is a “young creative”? Young creatives are the next generation of the creative class. They are engineers, poets, lawyers, computer programmers, scientists, artists and architects – anyone between 18-40 who creates for a living. Young creatives are vital to the economic success of a region and must have influence in regional plans for development. Updayton invites all young creatives to join together and speak to business and civic leaders about directions for the region at the Young Creatives Summit on April 18, 2009. This entry was posted on Wednesday, February 11th, 2009 at 10:43 am	and is filed under updayton. You can follow any responses to this entry through the RSS 2.0 feed. If you’re interested in what is happening in the Dayton music scene, please check my blog, The Buddha Den. In addition to local talent, we also help bring national touring acts through Dayton. Feel free to contact us for more information.